This West Wing is a tough neighborhood. Even AFTER Sean Spicer's successful get-back-on-the-horse presser yesterday, I'm told that a top White House official was discussing his possible replacement. On Day 4! With 1,457 to go in this term. A senior aide texted me at bedtime: "Back on track. Upper hand. Offense and action." Indeed, the team was feeling better after the reboot briefing by Spicer, plus a better-focused performance by POTUS. And the staff saw it as a home run when AFL-CIO boss Richard Trumka praised Trump's move to withdraw from the Trans-Pacific Partnership, with a statement headlined: "TPP Withdrawal Good First Step Toward Building Trade Policies that Benefit Working People." But inside, the finger-pointing and blame-casting continued. 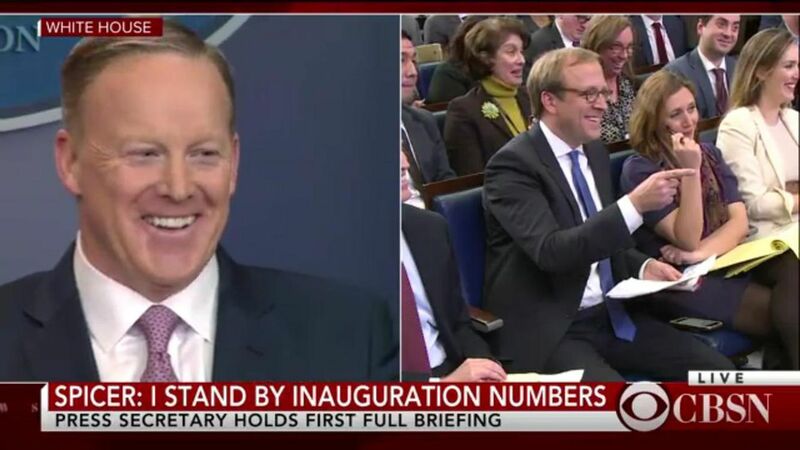 Unfortunately for Spicer, Trump is obsessed with his press secretary's performance art. Our Jonathan Swan hears that Trump hasn't been impressed with how Spicer dresses, once asking an aide: "Doesn't the guy own a dark suit?" Spicer looked a lot sharper yesterday than he did on Saturday — in a dark, bankerly suit. Maggie Haberman tweeted that at Spicer's Saturday presser, Trump "wanted him to be in command/project strength. He did neither. … [H]e wanted Spicer to be a derivative of himself -Trump almost always takes q's & slices it with humor." "As Trump thought about staffing his administration following his surprise victory, he hesitated over selecting Spicer … He did not see Spicer as particularly telegenic and preferred a woman." "Efforts to launch an outside group supporting Trump's agenda have stalled amid fighting between Kushner loyalists … and conservative donor Rebekah Mercer … Major disputes include who would control the data." Kellyanne "is arguably Trump's most recognizable aide, which has caused her to receive threats against her life. She has been assigned a Secret Service detail." "Conway said she now hopes to limit her television appearances. Instead, she is taking on an expanded portfolio, which will include health care and veterans' issues, and Pence — for whom she has worked for years as a pollster — is also expected to carve out more substantive responsibilities for her." Jim and I just popped up a new installment in our Trump 101 series: "With a black Sharpie in hand, he marks up the Times or other printed stories. When he wants action or response, he scrawls the staffers' names on that paper and either hands the clip to them in person, or has a staffer create a PDF of it — with handwritten commentary — and email it to them. An amazed senior adviser recently pulled out his phone to show us a string of the emailed PDFs, all demanding response." Read the rest, including the evening show Trump never wanted to miss. The N.Y. Times brings back the "L" word on A1, above the fold … "Meeting With Top Lawmakers, Trump Repeats an Election Lie": " Trump used his first official meeting with congressional leaders on Monday to falsely claim that millions of unauthorized immigrants had robbed him of a popular vote majority, a return to his obsession with the election's results even as he seeks support for his legislative agenda. … Trump used the opportunity to brag about his victory … [and] asserted that between three million and five million unauthorized immigrants voted for Mrs. Clinton." —"Dagger," Maggie Haberman labels this tweet from WashPost's Ed O'Keefe: "MCCONNELL on WH meeting with with Trump: "I enjoyed the president and Sen. Schumer talking about all the people they knew in New York." "Ford Motor Co. Chief Executive Mark Fields said he reread Mr. Trump's 'The Art of the Deal' over the holidays. … [T]hey have been rattled by a series of tweets by Mr. Trump accusing them of not being sufficiently committed to U.S. jobs and investment, given their heavy reliance on overseas production." "Auto executives … hope there might be an upside to Mr. Trump's close attention: "Trump's EPA nominee says he'll review Obama's stringent fuel-economy targets. "Trump's interactions with auto-industry chiefs extend back more than a decade to the days when he took the stage at the New York Auto Show as a spokesman for GM's luxury cars." Smarter faster: Trump's 100 days … "Trump makes his priorities clearer, and deportation of young immigrants has fallen off the list," per L.A. Times' Mike Memoli and Brian Bennett: "Trump signaled Monday through a flurry of directives and pronouncements that he will put a priority on remaking U.S. trade and tax policy, even as he quietly backed away from a pledge to end protections for nearly 750,000 immigrants brought to the U.S. illegally as children." Gallup says Trump's 45% approval makes him the first elected president in its polling history (back to Ike in 1953) to start below 50%. "Cities May Be Starting to Run Out of Millennials," by NYT Upshot's Conor Dougherty: "[D]emographers, along with economists and real estate consultants, are starting to contemplate what urban cores will look like now that the generation — America's largest — is cresting. … Apartment rents in San Francisco, Washington, Denver, Miami and New York are moderating or even declining from a year ago, according to Zillow." Even after being discharged from Houston Methodist Hospital following treatment for bronchitis, Barbara Bush, 91, stayed an extra night with former President George H.W. Bush, 92, who's still suffering from pneumonia but is ready to leave the ICU. Dr. Amy Mynderse said a a news conference yesterday: "Other than sleeping in separate rooms, … she has been sitting at his bedside most of the time." Dr. Clint Doerr added: "They're essentially therapy for each other. … [W]hen one of 'em doesn't want to take a breathing treatment, the other says, 'Git on that.' It helps our cause.' … I think 'Mrs.' commented to me, 'You need to get us outta here and tuned up, because we gotta host that Super Bowl.'" Per AP: "The couple's 72-year marriage is the longest of any presidential couple in U.S. history … Mynderse told reporters that when she informed the former president she would be speaking at a news conference Monday, he replied: 'About what?'" Worth the click … N.Y. Magazine, "Long on Trump: Wall Streeters like Anthony Scaramucci bet heavy on the would-be president back when that seemed like a pretty dumb investment. Bonus time!" by Jessica Pressler: "To be a big-deal person at a major Wall Street firm and publicly align oneself with a candidate who calls for the building of walls … would take … in the … parlance of the industry: 'Balls.'" … Since the election, much of the rest of Wall Street has come around to Trump, thanks to the rising stock market and the ascension of so many of their own." Classic headline from Kara Swisher: "As Yahoo moves closer to death, earnings beat expectations but the Verizon deal has been further delayed: Investigations into its massive data breach continue to cloud the company's $4.8 billion acquisition by Verizon." More IPO prep … "Snapchat wants to make fake news on its platform disappear, too," per Quartz: On its two-year-old Discover platform (brands like ESPN, Now This and We The People), Snapchat "now requires publications to fact-check articles for accuracy, not publish misleading or deceptive links … Publications will also have to [add warnings for] sensitive material." "Star Wars: Episode VIII" finally has a title: "The Last Jedi," to be released Dec. 15: "Speculation over just who the last Jedi is immediately ran rampant on social media. 'The Force Awakens' chronicled Daisy Ridley's Rey discovering her powers with the Force, but ended ominously with a withdrawn Luke Skywalker (Mark Hamill) on a remote island. If there's to be just one Jedi left, Luke's days could be numbered." That massive lapel pin Kellyanne was wearing on the Sunday shows, with "a rhinestone-encrusted presidential seal surrounded by an enameled ring that reads 'President of the United States Donald Trump,' is the creation of District jeweler Ann Hand." THANKS FOR READING! What did I miss? Just reply to this email with your links, tips and rants.